I write a lot about my younger daughter, Kat here, and post pictures about every week, but I don’t post as many pictures of Morganna, the elder daughter. In large part, this is because she hates to have her picture taken, and as she is seventeen, and has a bit more energy than I do, she can usually outrun me when she sees the camera coming. However, I do not want my readers to misunderstand what an important part of our household Morganna is, and how often she is in the kitchen with me, prepping, cooking and cleaning by my side. We have fun together, she and I, and that is as important to me as knowing that I am imparting to her important culinary and cultural lessons while we sing, dance and cook in the kitchen, with cats underfoot, friends and family strewn about and a baby at the center of it all. One thing I wanted to write about to tell everyone is that Morganna went out on Sunday and did something that I think is important for every ethical omnivore to take part in, at least once in their lives, if it is in any way practical for them to do so. She went to her friend’s farm, and helped her friend kill and butcher the calf she had raised by hand. I grew up helping my grandparents butcher chickens, cattle and hogs, and can still kill and clean my own fish without blinking an eye, so when Morganna asked if she could go help Celeste, I gave my permission gladly. I think it is important for all meat eaters to know exactly where their food comes from, and if possible, for them to take part in the killing and preparation of an animal for consumption at least once. Ever since Morganna was a tiny child, I never lied to her about where meat came from, just as I was never lied to by my parents or grandparents. In fact,when I ate any pork or beef from our farm, I knew exactly which individual animal any given bit of meat was from, because we put their names on the labels of the paper we wrapped each cut in before packing it away in the freezer. To some people, this is macabre, but to me, it is only giving the animal who we cared for, nurtured and then killed and cut up so we could eat it its due: recognizing the life and death of an individual animal by remembering its name as we ate it is a form of giving thanks and respect to that animal. So, I was pleased that Morganna was willing to help Celeste kill and butcher her calf, and allowed her to go. She was gone for about seven hours, and when she came back, she told me something that made me doubly proud of her, Celeste, and James, another friend who came to help. The three teens did the entire job themselves. Celeste’s father loaded the gun which Celeste used to stun the half-grown calf by shooting it in the back of the head. After that, her father stepped back, and the three young people did the rest of the work–and a lot of work it was. Even though the calf was only half grown–it is still a large animal, and required a great deal of muscle. Celeste gave the killing stroke by cutting the calf’s throat with a very sharp knife: Morganna held the bowl that collected the blood that drained from the carcass. The three of them did the skinning together; Morganna said that even though she had never skinned an animal before, she understood how it was to be done because she had seen me prepare whole tenderloins by trimming the silverskin–it is the same principle entirely. Gutting was accomplished by Celeste and Morganna while James held the hanging carcass still, and Morganna helped disjoint the legs and remove them with sharp knives and pure muscle-power. She once again said she understood how to do it because I had taught her years ago how to break down whole chickens into cooking parts, and the principles are the same–it is just that the joints are bigger in a calf. Anthony Bourdain is her personal hero, and she has read each of his books at least three or four times. Even though she was rightly proud of her ability to help kill a calf without flinching or feeling guilty about it, unlike her hero, I had to point out that she did grow up in a different culture than Bourdain did. He was very definitely a city kid, while she grew up in West Virginia, in a culture that is still very close to the land, and where hunting, farming and butchering are all a vital part of life for many people. Morganna came home tired and sore, but satisfied, with a small hunk of the tenderloin. She was too weary Sunday night for me to cook the steak for her, and instead just fell straight into bed to sleep for hours and hours. 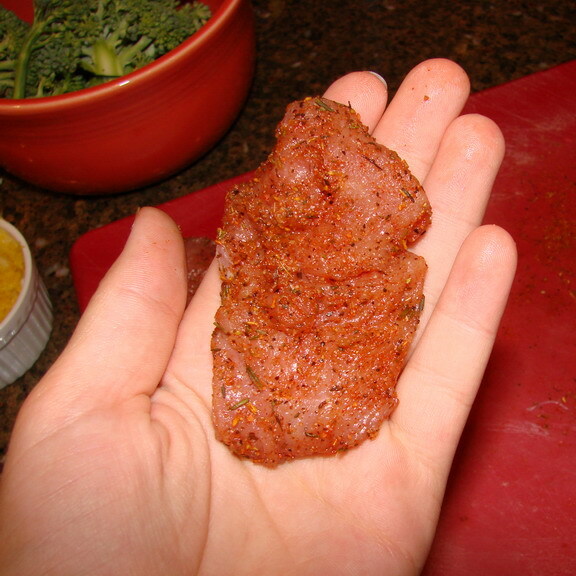 Last night, at midnight, Morganna decided she was hungry again, and since I was nursing Kat, she bustled herself into the kitchen and cut the tenderloin into tiny filets, and seasoned them. Then, she put a potato in the oven, and cut some broccoli, onions and garlic up to make broccoli with panch phoron–her favorite green vegetable dish. When the potato was done, she started browning the onions for the broccoli, and began to heat the cast iron skillet to sear the steaklets. At this point, Kat, who was asleep in my lap in the living room, woke up, her nostrils twitching at all of the good smells. Morganna was pleased to eat the fruits of her labor, and I was pleased that she is learning important lessons in where food comes from, and how to process it step by step, from the field to the table. We are lucky to live in a community which is close enough to the land so my daughters can grow up knowing where their food comes from. They can see firsthand the true cost of food, not just in economic terms, but also in sweat, bone and blood. They will grow up understanding that life comes from life, and all life comes from the earth and the sun, and to the earth, all life returns, in an endless cycle. Celeste told Morganna and James that the next time she butchers a calf, they will come and help. I think I will tag along so I can photograph the process and document exactly how one goes about killing and butchering a bovine in a barnyard. Hi. I grew up on a little farm with my parents. We raised mostly small animals. The largest were the pigs. Mom did the same thing when it came to labelling the meat when it went into the freezer. We knew which rabbits and chickens we were having for dinner that night. It was a chore, but I was involved with the slaughter for each of them, with the exception of the pigs which were done when I was at school. I appreciate the opportunity and never felt any guilt; with one exception that it sounds like Morganna was ready to recognize. The pain the animal suffers. I was being supervised by my parents and told to prepare a rabbit. I made a mistake and didn’t kill it properly. My step father had to step in and finish; I froze and was terrified by that experience. I had a crazy amount of guilt. I never saw a butchering go awry, Scotte–my Uncle John was always the one to stun the large animals with a shot to the head, and he never missed. He always dropped them easily in one shot, with no pain. Of course, the throat cut is the killing stroke, but once shot, the animals were beyond pain. I never killed my own chicken or rabbit, but I have done mercy killings of animals by the side of the road, hit by a car and left to suffer in pain and die slowly. It is agonizing to see an animal suffer, and it makes my stomach grow cold. If I, by a slip, didn’t kill an animal cleanly, I believe I, too, would be frozen in guilt for it, Scotte. I can only imagine how that was for a child. I’ve never actually killed an animal. Mostly from lack of opportunity. See, I’m really a city kid, but with rural roots. I grew up in the city, but when visiting relatives I learned to skin and prepare the field dressed bunnies, squirrels and fish brought in by uncles and cousins. I’ve eaten meat from animals I’ve known: watched grow up, fed, pet, chased and cussed. I can’t imagine not knowing where food comes from (any kind of food, whether animal, vegetable or mineral), if not the specifics: “These apples are from Mr Hurdy’s trees,” than at least in a general, “Olives grow on trees, tomatoes grow on vines” sort of way. I’m very much a city kid–well, okay, a suburb kid who finds it easier to just name the city he lives on the outskirts of–but I’m wholly comfortable with the knowledge of where my meat comes from. The “meat is murder” mantra doesn’t bother me because, um, I know that already. Just as I kill a field of plants so I can eat them, I kill a cow so I can eat it. I’m not blind to the animal’s feelings–that’s why factory farming pisses me off so much–but I will not shy away from the fact that for me to eat it, it must die. I might want to try slaughtering my own meat sometime. It’d strengthen both my understanding of where my food comes from and my bond with the animals in question. As a side note, I wonder how long it’ll take before PETA’s squadron of bloggers seizes upon this post. Beautiful words from a beautiful lady with beautiful daughters. My mother’s family had farms and while I never killed pigs, I helped with the butchering, cleaning the intestines for chittlings and making sausages. It never disgusted me because it was part of the farm year and because it was a reward for hard work and nothing was wasted. I think it is tremendously important that people know where their food comes from. I am very glad you allowed your daughter that experience. I know, without a doubt, that I could never kill or butcher most animals. I can catch and clean fish. Because of this, the only meat that I eat is fish. My issues with factory farming – care of animals while they are alive, environmental impact, etc – also play into my food choices. The bottom line for me however, is that I can’t do it, so I don’t eat it. Others can, so they do. What a great thing for your daughter to experience. And that’s wonderful that she was able to handle it with such dignity. It sounds like she and her friends are learning some important ethical lessons. As a city kid myself, the prospect of killing an animal and preparing it for cooking isn’t something I have done. Nor is it on my list of things I want to do. I wish I had been exposed to these things at a younger age like your children, as I think that exposure goes a long way. That being said, I think that city kids can still understand and appreciate how much more humane this type of slaughtering is than mass-meat-factory slaughtering. I do my best to purchase meat that has been humanely killed. But since I was a teenager, I have struggled with whether eating meat was right for me – nutritionally, I need it but being that I am unable to bring myself to deal with bones (let alone slaughter an animal), I wonder if I am being hypocritical eating meat at all (and as an aside, I have been a vegetarian in the past, but health problems caused me to start eating meat again). Can you be an ethical omnivore if you are unwilling to take part in the raising and killing of your meat? Sarah, I know I’m not the person you’re asking, but I’ll go ahead and attempt to answer. I believe you absolutely can, provided you, as you said, do your best to purchase your meat from the right sources. Stay informed, stay alert, and if you hear of someone treating animals cruelly, raise hell. Not everyone can raise and kill their own meat. Sarah, I am with Jim on this issue. Not everyone has the skill set needed to raise and slaughter their own animals. That is why we have farmers and butchers, and have had them for thousands of years! But Jim is right–seek out meat from humane sources–from the farmer if you can manage it. That is the only meat we eat in my household–the meat we buy from the farmers, and we know how the animals were treated both in life and in death. Not only is it better for the animals and the environment–it is better for you. Some of the stuff that is fed to animals in feedlots is purely foul, and does not belong in our food chain. I was directed to your blog site by Jim “Chew on that”…I am an avid meat eater and can’t imagine life without meat. I love vegetarian food and adore fish, chicken…everything actually. I love the story of your daughter and her butchering experience. I was brought up in town in the days when everyone had large gardens and when I was little chicken was a luxury. My father killed it. My mother dressed it. I still remember the smell of burning quills after plucking. The unlaid eggs went into the stuffing and all the offal was used into make gravy. I must say I’m glad I don’t have to do all of that but it was a wonderful education. My father’s family were farmers. He always went hunting & fishing and taught my brother how to do it correctly. This was never something that interested me but I always appreciated my father saying “Be careful what you shoot because if you shoot it you have to eat it too. We don’t waste life or food.” My mom and I helped clean the fish, pheasants, chickens, & ducks. It made for wonderful meals full of that richness of the earth. Your daughters have the good fortune in growing up understanding the whole process. One of the things I think that city kids miss out on if they don’t get to see it, is how much many farmers love their livestock. Morganna told me that as they led the calf to the place they were going to kill it and butcher it, they petted him and talked to him quietly and told him what a good calf he was, and that he wasn’t frightened at all. He never had a chance to get scared, he was treated gently and lovingly the whole time, and the girl who had raised him by hand, feeding him from the time he was born, and who taught him to drink from a bucket and then eat grass and hay, petted him as she led him out and then very carefully killed him so that he didn’t even have a chance to feel fear or pain. That is what many people don’t understand. Small farmers do not hate their animals. They care for them. They love them, and yes, they become attached to them. I know that we did with the cows, pigs, chickens and ducks on my grandparents’ farm. I was taught always to be gentle with them, not to frighten them or hurt them, and to be good them and give them good lives, because we owed that to them, because in the end, they would die so that we could live. That is what I loved most about Morganna’s experience–she could see that the calf was loved and respected and treated with honor through its life and its death. Maureen and Nancy–I agree–there is a richness to living life nearer the land. And there is great wisdom in the understanding that we neither waste life nor food. We do not kill for sport or pleasure–to do so is obscene–a mockery. And we must not waste any part of the animal–Nancy you hit it there. To use every bit is to honor its life and death. To waste it is to be disrespectful of the animal, the earth and life itself. But then, I have very strong spiritual feelings about food and farming, life and death, as folks may have started to glean from my writings. Ow wow. Morganna never ceases to amaze me. Due to your blogs, I made myself look at the sides of beef in a farmer’s market last week. I usuall shy away from things like that, but it wasn’t as bad as I thought it was going to be. A friend of mine pointed me to your blog, and it’s really making for lovely reading. One of the interesting distinctions in US life that may not hold as true in other countries is the “city kids who don’t know about life vs farm kids who do”. While I’m from New York City, my family is from Jamaica, where even in the largest cities (such as Kingston, where my grandparents and some of my aunts still live) everyone keeps chickens and goats and even pigs. So I saw ‘where meat comes from’, despite being a city kid, and certainly all the Kingston kids knew. I wonder if excessive sheltering is more a factor of culture than location? Also, your daughter sounds like a magnificent young woman, and from what I’ve read of how you’re raising your children, this is both wonderful and unsurprising. I’m a vegetarian, but I’m really impressed like this. I wish more meat-eaters were so informed about the decisions they make. Barbara and I have had this conversation, but I think it’s relavent, so I’ll share it here. I’m somewhat of a city boy. Born in Baltimore, Maryland, raised mostly in suburbia of small Ohio towns. Dad, who grew up on a farm and worked on several from the age of 11 to about 21-22, used to talk about cuts of meat and preparation when we’d have dinner. We’d go to a restaurant and Dad would talk to me about the quality of the meat, and the fat. He could tell what was free range and grain fed, (back before the smoking really effected his sense of taste.) We talked about the musculature, and organs and health. For me, (who wanted to be a biologist back then,) this was a treasure trove of information. When we lived out in the country when I was 5, Dad would go into the woods behind our house and go deer and squirrel hunting. I didn’t go because I was a chatterbox, (amazing how some things don’t change, huh?) and wanted to talk to Dad the whole time, (To me, it was just a nice walk in the woods, and Dad just happened to be carrying a gun,) which frightened off the animals. But dad would never gut the animals, (the squirrels at least, the dear presented some problems, so he’d do the minimum he needed to effectively move the animal,) until he got home because I wanted to help. Dad would bring the squirrels in, and we’d lay paper towels down on the linoleum floor of the kitchen, and then we’d cut them up. I’d point out the heart, lungs, ribs, intestines, etc, and regail my father with my knowledge of how they all worked to keep the squirrel alive, (he’d just smile proudly, nodding as if he didn’t know.) It’s one of my fondest memories of growing up. And yes, farmers have hearts. Honest. My uncle was a dairy farmer in Adams County, Ohio for years and years before retiring, and while he had several dozen Holsteins. He knew each one. He loved each one. If one got sick, he fretted the way he would over a child. I remember staying with them one summer, and every morning after breakfast, he’d smile and say he “had to go check on his girls…” as he left the table. So, you don’t necessarily even have to be “country folk” to have these experiences. To kill without remorse, yes, truly a wonderful thing. So Vlad, (can I call you Vlad?) I take it you don’t know me too well, huh? I mean, all my uncles can tell ya that making snotty self-righteous comments about me on the internet is a sure fire way to correct my “incorrect” behavior. Oh, and judging someone for “killing without remorse” isn’t very wise is it? I grew up cleaning fresh fish. I now garden as well as raise my own chickens and goats. We intend to raise a locker calf next fall. My meat is known to me almost from cradle to freezer. The vast majority of my tomatoes, cabbage, beans and potatoes, milk and cheese are as well. I know what goes into raising them and processing them for the table to nourish my family. Less food gets wasted when you have to sweat to produce it. You are FAR less likely to let those tomatoes go bad in the fridge after you have sweated to grow, harvest, process, then cook them. Same with chicken or beef. What a wonderful post! It is truly beautiful to be able to see and experience the cycle of life. The love and appreciation born through knowing where your food comes from is something that many people do not realize that they are missing. Barbara, I love your blog! and you are truly an amazing woman to be able to raise such a well rounded and mature daughter. Sorry, I don’t find this at all charming. Tossing in a bunch of words like “honor” and “respect” does not take away from the fact that you people are bloodthirsty and cruel. I’d bet anything Morganna thinks it makes her “one of the guys” to be able to betray the calf’s trust of his caretakers. And yes, i’m vegetarian. Have been my whole adult life. Alex–if you really think we are so bloodthirsty and cruel, do you think it is a good idea to insult us? Get off your high horse. I respect your right to be a vegetarian, but you have no right to call me or my daughter freaks and judge us because we make different dietary choices than you do. If you do not believe that I can be an ethical omnivore, that is your opinion, but if you want me to listen respectfully to your opinion, I highly suggest that you state it in a respectful fashion. Calling people names does not lend strength to your argument. It only makes people think that you are an immature, unintelligent person who can not argue without resorting to bad behavior and name calling. I don’t know if I am intelligent or not. I merely stated that I find it horrifying to speak about killing an animal with such unabated joy. And yes, i do find it disturbing when somebody takes such gleeful pleasure/joy in killing. If one has to kill to live, that is one thing, but to expound in detail about how they spoke to the calf while leading him to his death, I find creepy. I never said being vegetarian was superior, just that I was not being hypocritical in denouncing the needless slaughter of animals. Be honest, this is not about being an ethical omnivore, it’s about taking joy in having the fortitude to kill an animal. Alex, I think that you are reading the bloodthirstiness, cruelty and unabated joy into the post. Where is the animal treated cruelly? Was it caused great pain? Was it killed slowly? Was it tortured? Did my daughter laugh in glee to see it writhe in pain? Did I go on in rapturous prose over the death throes of the calf? What is so cruel to kill an animal which was raised lovingly quickly and as painlessly as humanly possible? Would it be better to let the animal loose into the environment to starve? If it is merely cruel to kill the animal painlessly and quickly, and you ignore the care and love it was given in life–then how is that bloodthirsty? How is that taking joy in pain, if pain is not given? Is death then, the ultimate cruelty? How do you feel about euthanasia for pets who are suffering from a painful incurable disease? Is it cruel to shorten their suffering? I do not understand your insistence that I and my daughter, and presumably any other omnivorous farmer, hunter or fisherman who has done his or her own killing, are cruel, bloodthirsty and that we take pleasure in killing. I may take pride in killing quickly and cleanly, but that does not mean I enjoy killing. I think that you are coming here just to insult myself and my daughter, and you don’t care about anything other than calling us names and insulting us and our food choices. I think you should be honest–this isn’t about denouncing needless slaughter (how do you know it was needless?) but you get off on insulting other people. Well, yes, killing to eat something you don’t need to eat is in fact, needless. And I’ve seen a massive number of chefs and others insult vegetarians and write off anyone that chooses to not consume animal flesh as a wacko. Look at Gordon Ramsey taking such joy in lying to a vegetarian visitor to his restaurant that a dish was vegetarian when it wasn’t. Or his nasty stunt sending his sidekick to give out horsemeat at a racetrack. People such as this think it’s funny to humiliate those of us who are animal lovers. What I find disturbing is your excitement over killing. If you do need to kill for food, why not just do it? Sure, there are plenty of hunters and fisherman in the world who kill and eat what they kill. Why would you want or need to highlight the ethics involved? If you slaughter a farm animal to eat, why not just do it? Whyever would you need to engage in discussion of ethics? Candidly I’d find it far more ethical if the farmer were more distant from an animal who he intended to kill. It’s downright creepy to brag about how much the calf trusted you while you were planning it’s slaughter. Yes, I do find it bizarre to brag about how the calf trusted you while you were leading it to slaughter. If one could anthropomorphize, we’d say the calf had no idea that the farmer who’d raised him, petted him, loved him and given him treats was planning all along to kill him. Sorry, but that is odd. You have a chip on your shoulder. You are making claims about my post that do not exist. You talk about how disturbed you are at my excitement over killing. Where in the post is that? It isn’t there. It is in -your- head, along with Gordon Ramsay and all the other people who have made fun of vegetarians who ARE NOT ME. I have always said and will continue to say that vegetarianism is a legitimate, ethical option for those who are disturbed by killing animals. What I find to be an unethical position are omnivores who want to eat meat, but do not want it to look like it came from an animal, and who want to know as little as possible about the slaughtering process. THAT is an unethical position, not vegetarianism or veganism. Such a position, of being an omnivore who doesn’t want to look animals in the eye and admit that they are eating them, is what allows the horrors of factory farming and unsafe, painful slaughterhouse practices to flourish. If more people looked meat in the eye, they would demand decent treatment for animals–AS I DO–or they would become vegetarian–AS YOU HAVE. I am not you, you are not me–we have differing opinions and life experiences. I can accept that. I can accept that you find eating meat disturbing, but what I absolutely, positively will not accept is your inability to carry on a dialog with me that is actually with me–not with your preconceived notions of omnivores as terrible, cruel, evil people. You cannot separate myself and my daughter from Gordon Ramsay or any other obnoxious person who has ridiculed vegetarians and who are hateful people. Therefore, this conversation is over. If my post disturbed you so much, do me a favor, and walk away, shaking your head about what a terrible person I am. At this point, that is fine with me–you have already decided that I am evil, and you have constructed an evil person with my name and face in your head, so just walk away and take that person with you. It isn’t me. It is you. I will only say one more thing. This conversation has highlighted to me -why- so many omnivores think that vegetarians are not very nice people. My experiences, up until now have been the opposite–every vegetarian and vegan I have known has been sensible, rational, ethical and able to carry on a conversation without pointing fingers and calling names. I guess I have just been lucky. I was directed here by a friend (not sure how he found your blog) after he read a post I’d written about killing live lobsters. He guessed that I’d enjoy this story, and he was right. BRAVO Barbara…I wholeheartedly believe in reasoned debate and find that having conversations with those whom I disagree is a wonderful way to learn and grow. I may not end up agreeing with them, but at least I’ve tried to appreciate their perspective. Your posts to Alex were fantastic, you maintained your composure and allowed his own narrow opinions illustrate your point. Good for you to hold the high ground and walk away with dignity. As one who was raised around farms and hunts I appreciate the lessons your teaching your daughter. The same one’s I’ve tried to instill in my 17 y/o daughter. I am much better at keeping my head in written conversation; if I had been debating ftf with Alex, I think that i might not have been quite so polite. And here’s to teaching our kids the values of ethical eating! What a cool blog post! You all can come help on our farm anytime!!! Thank you for this post. I’ve been struggling with the ethics of my food choices for several years (including a stint with veganism that landed me in the hospital), and have walked a delicate balance as an omnivore for quite some time… I’ve always felt an incredible amount of guilt at the thought that an animal would feel terror or pain when they’re killed for food, but after reading your post (and having discussions with local farmers), I’m feeling a lot more comfortable with these ethical butchering practices. While I don’t have the courage to ever kill an animal myself, I have an incredible amount of respect for your daughter for having done so.